KOKOMO, Ind. — Indiana University Kokomo celebrated the academic achievement of its students at two events Monday (May 7). Master's Recognition & Hooding Ceremony. View Flickr slideshow. Master's degree students were honored at the annual hooding ceremony, while undergraduates received awards at the Honors Convocation. Chancellor Michael Harris said the honors are deserved, because the students went beyond what was expected. The ability and desire to achieve will set them apart in a competitive world, he said. "The future is bright for those of you who work hard and are ahead of others," Harris said. "You are the ones who will be our leaders, and take us to a great future. Those who are great learners are great leaders, and vice versa." Susan Sciame-Giesecke, executive vice chancellor of academic affairs, said faculty and staff look forward to these events. "These events remind those of us who have dedicated our lives to higher education why we have made that choice," she said. 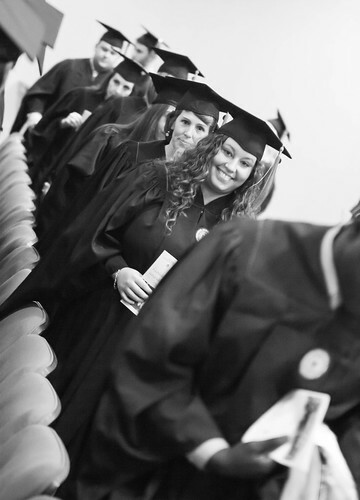 The hooding ceremony honored 34 master's degree recipients, in business, public management, and liberal studies. Kathy Parkison, assistant vice chancellor of academic affairs, said the hood marks them as receiving graduate degrees. Each student received his or her hood from a mentor faculty member. Julie Dorneman, who earned a Master of Arts in Liberal Studies, said she has grown as a person while earning her degree. "You can study things that are interesting to you, and you see how different topics intersect with each other," she said. "I feel like I've stretched intellectually." Don Smith, who earned a Master of Public Management, hopes his new degree will bring him full circle – back to his original career in teaching. He taught high school business classes before his banking career. He wants to teach at the college level after he retires. Smith said he'd always wanted to earn his master's, but "it never seemed to be the time. Finally, it was either I did it now, or I never did it." Tiffany Damitz hopes the Masters of Business Administration she has earned will help her advance in her career. She is now considering doctoral programs, so she can teach at a four-year university. "I gained a lot of knowledge in this program, and I grew professionally," Damitz said. "This is going to help me grow into more leadership roles." At the honors convocation, nursing student Brian Arwood was honored for his leadership, receiving the Outstanding Student Leader award. "It's a great recognition for all the work I've done for our student organizations," he said. Honors Convocation. See Flickr slideshow. 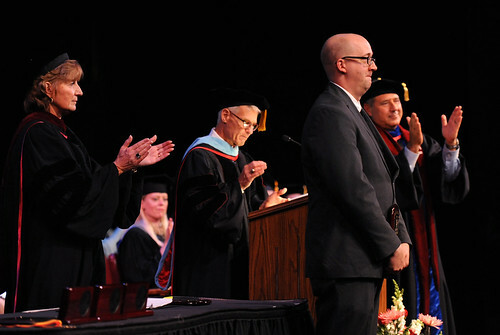 Faculty members also received honors during the convocation, as Jeremy Gibson, student body president, presented the Amicus awards to Christina Downey, assistant professor of psychology; and adjunct faculty members Michael Fiscel and Joseph Seaborn. Students choose these award winners through a vote. Rachel Marschand was one of three students who earned academic honors degrees. She chose the program because "the coursework is designed for someone like me, who likes to do more rigorous work and go beyond what is expected." She hopes that hard work pays off with admission to graduate school. Tom Etter's hard work has already paid off, with early admission to the IU School of Medicine and a $120,000 scholarship that will nearly pay his tuition. He received the outstanding student award in arts, biological and physical science, for the second year in a row. "I am so honored to receive this award again," he said. "I feel really happy about it."